The Connector 2.2 is announced for release in December 2015. The new version of The Connector adds support for the JIRA REST API to allow it to work with JIRA OnDemand and JIRA 7. 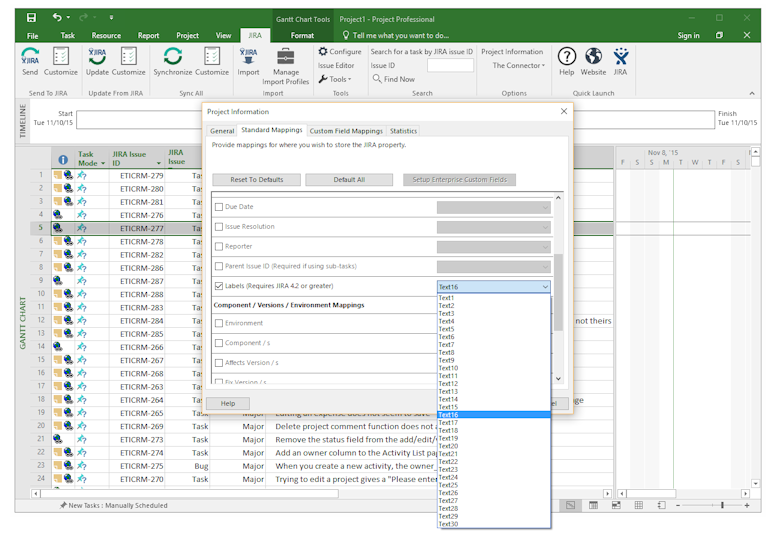 We are testing support for Microsoft Project 2016 and Windows 10 to ensure everything works correctly. A BETA build of the new version will be released in the coming weeks for anyone wishing to give the new version a try. Support for JIRA 7 and JIRA OnDemand - Option to use the JIRA REST API for communication with JIRA eliminating the need for the JIRA side server plugin and allowing The Connector to be used with JIRA OnDemand and JIRA 7 and up. Updated User Interface - The product has been updated to a new font and green color scheme to integrate more smoothly with MS Project 2013 and Project 2016. 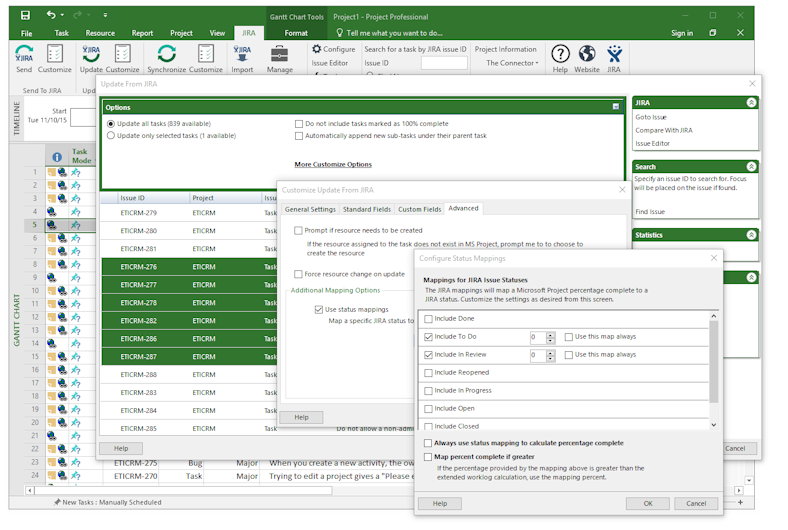 Tested support for Microsoft Project 2013 and Microsoft Project 2016, Windows 8 and Windows 10. 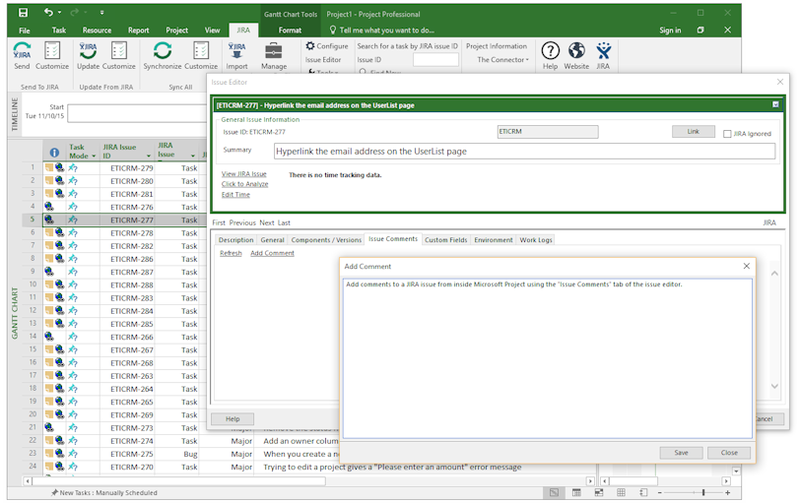 The Connector 2.2 will support MS Project 2003, 2007, 2010, 2013, and 2016. Support for exchanging JIRA labels between Microsoft Project and JIRA - The label field can be mapped like other JIRA fields and will allow for exchanging labels in both directions with JIRA. Import wizard now supports JQL as a import filtering option - The import wizard will allow you to specify a JQL query so you can use the power of JIRA query language to control which issues are imported from JIRA into MS Project. 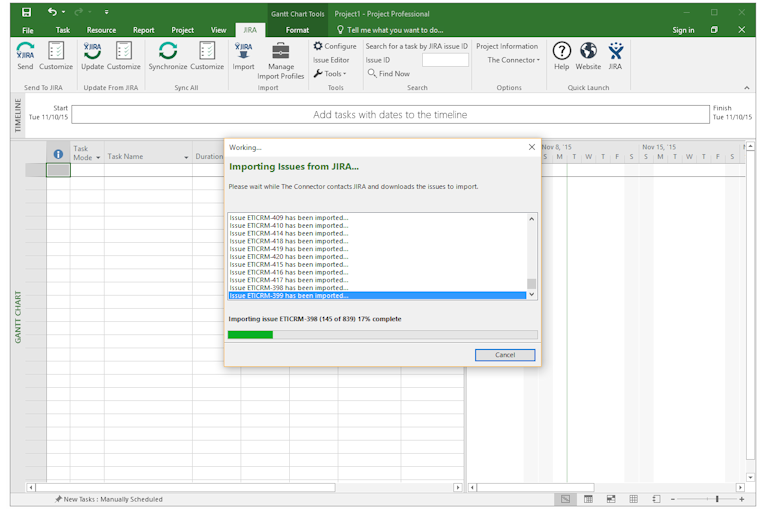 Ability to manage JIRA versions from within Microsoft Project - There is now a version editor built into The Connector so you can add/edit/delete JIRA versions for your project without needing to leave MS Project. Ability to add a comment to a JIRA issue from within Microsoft Project - Using the issue editor, Comments tab, you can now quickly and easily add a comment to your JIRA issue. Added additional error handling and validation messages to a number of places in the product making it easier to use. Improved language support and options - We are working on adding more languages and translations for non-English users to use a native language. More details will be released shortly with the availability of the BETA version.